The company has earned several various national awards that demonstrate the most reliable IT business solutions, as well as the expertness to implement complex and high-performance projects, required in the global business arena. • The Distinction in e-Commerce Award for successful and innovative practices applied at the online store markakis.gr. • The Bronze Prize for Eshop Cloud Infrastructure of Cosmossport.gr, an online store of which operates continuously 24/7 and 365 days a year, serving more than 60,000 electronic users. 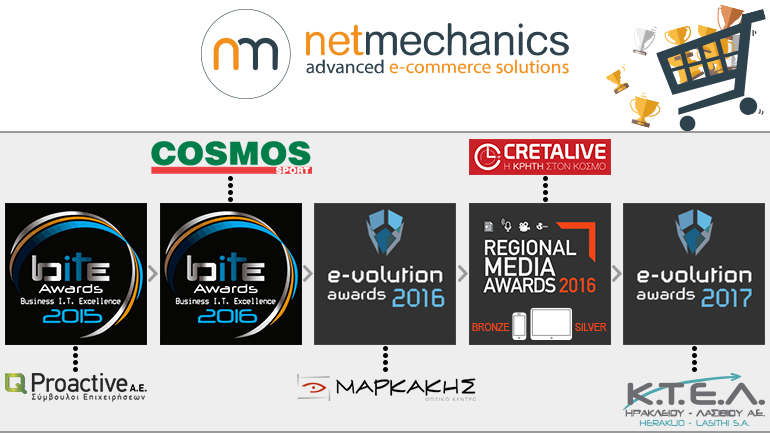 "Now, we can serve even 60,000 unique visitors to our online stores and everything works flawlessly..."
CosmosSport.gr teamed up with Netmechanics Advanced E-Commerce Solutions to ensure the quality of its systems and the long-term success of its business plan, and to maintain high online sales. "The rapid growth of e-commerce requires secure cloud-based solutions": Netmechanics Advanced E-Commerce Solutions reported in a special report by Netweek magazine. "By using cloud to our customers, we deliver maximum data security and fast loading page, uninterrupted operation of systems and immediate high-volume ordering." Their projects gain high availability with 100% uptime and autoscale and becoming "smarter" by using Business Intelligence tools, ensuring increased sales."